As expected, Microsoft(s msft) on Monday took the wraps off of its Surface 2 and Surface Pro 2 tablets. Unlike last year’s LA-based launch of the original Surface, this New York-based event was a little more subdued. That makes sense: After a $900 million inventory write-off of the Surface RT, Microsoft needs to get serious about selling its new tablets as viable competitors in a crowded market. The new Surface 2 is a second-generation Windows RT device, though Microsoft has dropped the ‘RT’ moniker in the tablet’s name. It’s been upgraded with a Tegra 4 chip to run three to four times faster than the original, and the tablet’s 10.6-inch screen now features a much sharper 1920 x 1080 resolution. Battery life has also been improved 25 percent over the original, and the tablet’s front-facing camera features a one-third-inch sensor. Microsoft is including free international calling via Skype and free Skype Wi-Fi hotspot for a year when you buy the Surface 2 or the Surface Pro 2. You also get 200GB of SkyDrive support for two years. 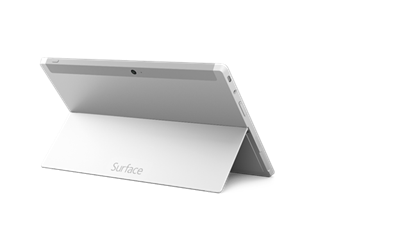 Physically, the Surface 2 is thinner and lighter than the original. The tablet now features a two-point adjustable kickstand that makes it easier to use at different angles, like on your lap. It also uses USB 3.0 ports in place of USB 2.0. These are welcome upgrades, and they definitely help keep the Surface 2 competitive with other new tablets on the market. But the key here is price. Last year’s Surface launched at $500. Judging by sales, that was clearly too expensive. At $449, the Surface 2 is priced a bit better, but it still competes against Apple’s(s appl) almighty iPad, which definitely has the market cornered on tablet app selection. One thing the Surface 2 has going for it is Microsoft’s full Office suite, which includes Outlook this time around. Still, without a bigger drop in price, the Surface 2 is also competing against Intel Atom-based full Windows 8 tablets, which have the added benefit of running Windows legacy software. At $449, the Surface 2 remains a bit of a hard sell. That brings us to the Surface Pro 2, which uses Intel’s fourth-generation Core “Haswell” chip. Microsoft claims it is faster than 95 percent of all laptops on the market. Graphics performance has been increased by 50 percent and overall performance has been bumped up by 20 percent. It features twice the internal memory over the prior model, which should give a good bump in performance and increase battery life a whopping 75 percent over the original. Microsoft has boosted speaker performance and added Dolby audio enhancements. The Surface Pro 2 also features the same adjustable kickstand as the Surface 2. It’s still pretty pricey, though, at $899. In addition to the new tablets, Microsoft also unveiled a new Surface Docking Station. The Docking Station only works with the Surface Pro and the Surface Pro 2, so Surface RT and Surface 2 users are out of luck. The dock features three USB 2.0 ports one USB 3.0 port. It allows you to attach a keyboard and mouse to your Surface Pro, and features a mini DisplayPort for you to connect the tablet to an external display as well as an Ethernet port for using a wired Internet connection. Audio in and out ports allow you to connect to a mic and external speakers. Basically, it transforms your tablet into a desktop computer. Microsoft also unveiled the Type Cover 2, which works with the Surface 2 and Surface Pro 2 and is 1mm thinner than the original. The keys are silent this time around, and Microsoft claims that key travel is significantly faster than thanks to some physical adjustments. It is also backlit and uses proximity sensing to automatically dim the keys, which is a nice touch. Finally, a new a Power Cover accessory can help boost the Surface Pro 2’s overall battery life up to two and a half times more than the original. Pre-orders for the new Surfaces and accessories begin tomorrow, September 24. The tablets will be available on October 22, shortly after Windows 8.1 comes out. I’m reporting live from Microsoft’s event and will get to spend some hands on time with the new tablets shortly. Check back later today for my thoughts and impressions. “Flops and ladders” from MicroBallmer. Looks like the surface pro 2 is going to suffer because of high cost again. Notice they say 899. Then show lots of SPEC options, but only the base price which I assume is for the 64gb version…. Bet the 512gb 8gb ram version is not 899….